The 64″ ValueJet 1624X prints up to a blazing 600 sqft / hr, giving you a remarkable new printer that is second to none. 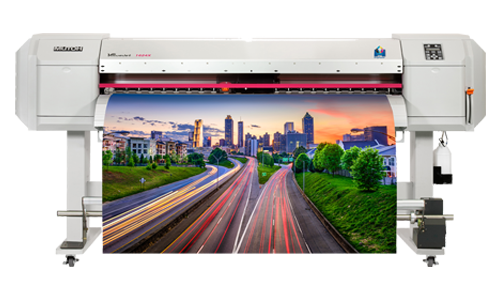 The Eco-Ultra ValueJet 1624X’s technological advancements set a new standard for large-format printers. Utilizing a state-of-the-art print head, this exciting new ValueJet gives you unsurpassed print speeds for a printer in this price range. Create vehicle wraps, indoor and outdoor signage, banners, decals and stickers, trade show graphics, wall decals and much more, efficiently and quickly. Includes Smart Printing Technology like DropMaster ink technology that assures the highest dot placement accuracy and eliminates the need for individual head adjustments per individual type. The VJ 1624X features precision craftsmanship and is built to highly rigorous standards based on our iron-clad commitment to quality, so you can expect years of use out of your ValueJet 1624X. Put the power of the Mutoh ValueJet 1624X to work for you.